There is no need to spend ages filling up a tank up with petrol, devoting time and effort to maintaining an engine and no messing around with potentially dangerous cords, thanks to the powerful, cordless Series X2 hedge trimmer from Aerotek. Simply pop in the powerful Series X2 40V lithium-ion battery and at a press of a button you are ready to go. This innovative battery will give the same performance as petrol or corded garden tools, without the hassle. The battery even has a handy indicator light allowing you to see exactly how much life is left. One full charge will give up to an hour usage. Spend less time working and more time relaxing thanks to the extra-large 500mm cutting length, that will let you cut through branches quickly and more effectively. There is also a 16mm cutting capacity to allow you to cut through branches up to 16mm thick with ease. The telescopic range of 2.2 – 2.75 metres allows you to trim up high with ease, great for getting to those hard to reach areas. The head angle is adjustable by 135 degrees making it easy to cut both the top and the sides of the hedge with ease. 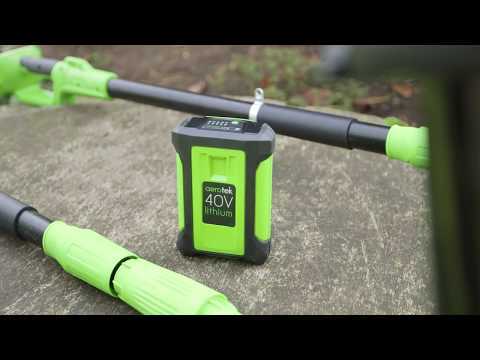 Thanks to the cordless nature of this pole trimmer there is no need to worry about being connected to a power source or accidently tripping over an unruly cable, giving you the freedom to work anywhere you may need to. Whilst you’re hard at work you can enjoy using this model thanks to the provided shoulder harness. To top it all off, the brushless motor cuts down on maintenance completely, meaning once you’ve finished making you garden look great, you really have finished. If you’re fed up with having different batteries and chargers for all those different garden tools, then we have a solution. We have designed our quick charging battery to work with the whole Aerotek series X2 Garden Power Range. Simply put the same battery in any compatible product for the same performance as petrol or corded garden tools, without the hassle. The battery even has a handy indicator light allowing you to see exactly how much life is left.